He feels, alive within himself, mimetic forces that he had thought long since dead, while nature, which possesses them all, transforms itself to resemble the moon. This quote expresses the relationship of similarity that Benjamin observed that exists between the different forms of nature, between the macrocosm and the microcosm, making, for example, the cloud clusters resemble anthropomorphic forms or that certain dances are similar to the movements of the stars. These affinities would be produced by the so-called mimetic forces, which the human being is able to feel and identify by carefully observing nature. Camnitzer has placed this sentence, in the form of a circle, throughout the inland of the island. For this, he has fragmented it into five parts, each of which can be found in a significant place in relation to art and/or landscape. The viewer has to move around in a circle around Ibiza to be able to fully contemplate the work. Thus, Camnitzer’s project escapes the white cube to integrate into the landscape of the island in a subtle way, while physically connecting the viewer with the island through the mimetic forces: imitating the circular shape common to celestial bodies and their trajectories. In the gallery – whose geolocation coordinates give the title to the project – there is a scale replica of the circle with the complete sentence; the site-specific installation can be visited, fragment by fragment, following a map with the coordinates of each of the points where the plates are located are provided. 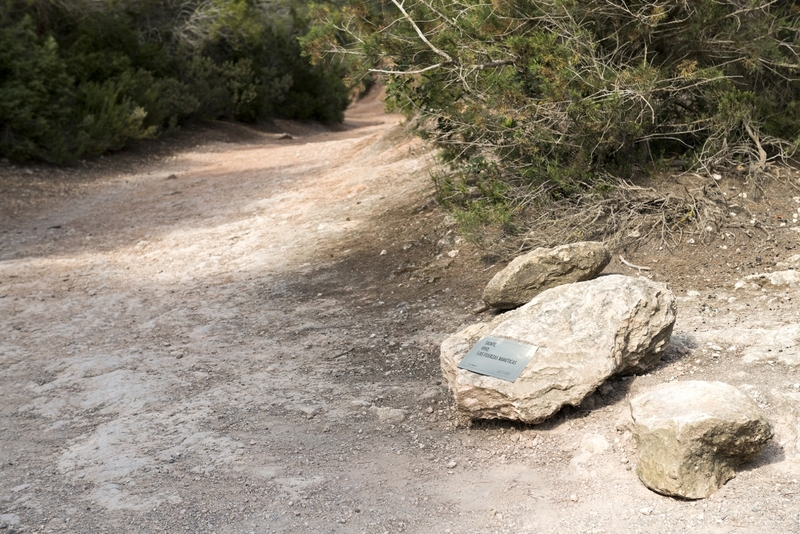 The work of Camnitzer proposes an itinerary in which the displacement of the body pursues the sequence of language, art is inscribed in nature and different temporal strata of the cultural history of Ibiza converge through artistic creation. Luis Camnitzer (b.1937) is a German-born Uruguayan artist who lives in New York since 1964. His work explores subjects such as repression under systems of power, pedagogical norms, and the deconstruction of familiar frameworks. His use of language as an art medium has distinguished his practice for over five decades. His work has been shown at important institutions since the 1960s, including solo exhibitions at El Museo de la Memoria y Los Derechos Humanos, Santiago, Chile (2013); Kemper Art Museum, St. Louis, MO (2011); El Museo del Barrio, New York (1995); Museo Carrillo Gil, Mexico City (1993); List Visual Arts Center at M.I.T., Cambridge, MA (1991); Lehman College Art Gallery in the Bronx, New York (1991); Kunsthalle Kiel, Germany (2003); Daros Museum in Zurich, Switzerland, El Museo del Barrio, New York; and Museo de Arte Moderno de Medellin, Bogota, Colombia (2010–13). The Museo Nacional Centro de Arte Reina Sofía is planning a large-scale retrospective of the artist to be opened in October 2018. Camnitzer’s work is in the permanent collections of Museum of Modern Art, Metropolitan Museum of Art, New York; Whitney Museum of American Art, New York; Solomon R. Guggenheim Museum, New York; Museo Nacional Centro de Arte Reina Sofia, Madrid; Museum of Fine Arts, Houston, TX; Tate, London; Museo de Arte Latinoamericano de Buenos Aires, Argentina; and Daros Latin America Collection, Zurich; among others.